Dice is dice, right? So what does SafeDice have to offer that is new? The answer: A lot. Let’s start with the variable house edge. Yes, the house edge is not fixed: it varies depending on how much you bet, and what the win could be. For new players, this is a very confusing concept. The default house edge is a slim 0.5%. Only when a player wants to make a bet with a potential win above 0.25% of the bankroll, a higher house edge will be triggered. That means with a 100 BTC bankroll, any bet with a profit of over 0.25 BTC will have a house edge greater than the default 0.5%. Betting itself is very convenient and player-friendly. Nothing is left out of the betting platform; there is an auto-betting feature, quick statistics, an easy-to-use hi/lo switcher, hotkeys, halve/double/max wager buttons, and a very cool animated “Roll” button. The chat box is active and generally welcoming. Betting speeds are above average, but they are nothing special or exceptional. SafeDice is not only offered in English, but Chinese also. Two-factor authentication is integrated as well as a generous revenue-sharing referral program. The referral program has even more add-ons like pre-loaded links, allowing referrals to receive a small Bitcoin bonus upon sign-up. The appearance is nothing like any other dice website. Words cannot easily describe the beauty and creativity of SafeDice. I’ve reviewed the appearance of stunning casinos such as FastSlots, but nothing I’ve reviewed has quite wowed my eyes this much. Everything is perfect: the layout, the typeface, the colours, and the superb simple animations. From the login page and on, the site is smooth and loads very quickly. Nothing is ever hard to find, as everything is only a link away from the home page. The aim for SafeDice is not to earn a quick buck, but rather focus on building to the top by being fair. With a tiny 0.5% house edge, would it not seem like a scam? Lucky for us players and investors, the “verify” tab proves that all rolls are fair. Just like other sites, the hash is produced from the server seed, client seed, and seed increment (nonce). The built-in verifier lets you enter in your roll information to prove your bet result was obtained legitimately. Financials have been quite a large problem for everybody involved with SafeDice. The administrator implemented the variable house edge for this reason. The dynamic edge allows bigger bets, while adding extra protection to the bankroll. At the time of writing, the bankroll is a petite 70 BTC and the max win is 8.7 BTC. Any bets above the amount of 0.44 BTC will have a house edge above 0.5%. So is this a bad thing or good thing? A lower house edge means less profits for the house itself, which in turn pushes potential investors away. The house also profits slower due to a small house edge for the majority of bets. 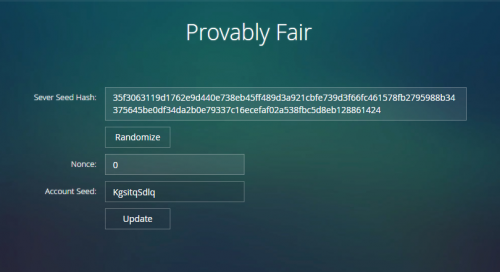 At the time of writing, SafeDice currently stands at a mere 3 BTC in profit. SafeDice is the ideal dice site that any player would want to have. Most sites have a balance of performance and looks, but SafeDice’s advanced coding technologies allows it to excel in both. The 0.5% edge is what attracted me initially, and then the fun chat box forced me to stay. SafeDice is one of my top dice sites for a reason, and I have a vision for growth that SafeDice’s owners’ hard work will pay off. SafeDice has everything. The looks, the insides, fast betting speeds, a fun chat window, a tiny house edge, and an affiliate program. Not to leave out smaller things like 2FA, the variable edge, and fast withdrawals. The betting is provably fair, although financials may not be of the best start for investors and players. Investing early may be a good option, as what SafeDice has to offer may bring in many new players as time goes by. Reviewers note: As I reviewed SafeDice, one thing kept popping up in my mind. Older Bitcoin users may remember EveryDice.com, a dice site from long ago. The site was beautiful, fast, and had a design extremely similar to SafeDice. The site layout seems the same, and they both offer(ed) features such as pre-loaded referral links. Betting animations were also the same. I am not saying that they are/were both owned by the same person, or that SafeDice will end as a scam; this is just a note to keep in mind. SafeDice does not currently offer any Bitcoin bonuses to its players!